I’d like to be able to archive podcasts on a dedicated media drive. I currently do this manually, copying them out of the appropriate iTunes directory once or twice a year to the media drive and deleting them from the original directory. I always worry that going behind the back of iTunes like this is going to mess something up. In an ideal world a folder action or an automator script would just watch a certain podcast directory, and copy the file to the media drive automagically every time that iTunes downloads one. 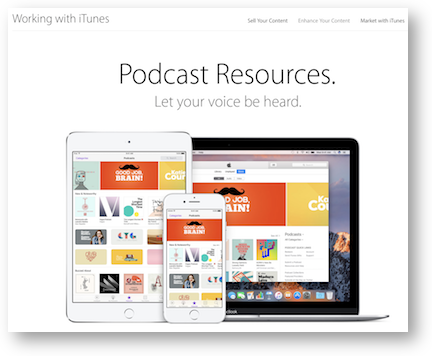 Then I could set iTunes to delete podcasts after they have been listened to, and I’d have the best of both worlds – a lightweight, trim iTunes folder, and archived backups of podcasts. However, I’ve never really grokked Apple automation methods. Or do you have any other ideas? The goal is to free up space from the gigabytes of podcasts that accumulate in my home folder on an SSD while retaining the ability to occasionally go back and listen to an older podcast without downloading. First of all, Kurt, you’re not in any danger of irritating the Mac if you delete podcasts manually from the Finder. I’ve done it for ages. Deleting the folder structure itself might be problematic but you’re not doing that so you should be ok.
Hazel is a system preference pane that lets you point at folders and make decisions on what happens to the files within. I create GIANT files every week for the podcast, (a typical raw Chit Chat Across the Pond is 1.5GB and gets replicated at least once in the process). 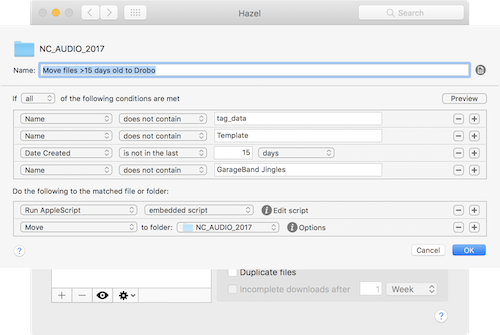 I have Hazel watch my creation folder and when the files are 15 days old, it moves them off to my Drobo for long term backup. Moving means not a copy but the original is gone from my folders. For something simple like the process you need, Hazel is pretty easy to figure out. You start by pointing Hazel at a folder, in this case, it would be the folder where iTunes plops podcasts. Maybe there’s some podcasts you want to keep (like mine) and some you don’t, you could make a set of rules for each one, or watch the whole podcast directory. Let’s assume you want all podcasts preserved. You add that folder to the left pane, and then on the right pane you tap the + button to add a rule. You give it a name, say Archive Podcasts for example. Then you set conditions for the action. In my example there are some files I don’t want to mess with so I added conditions to exclude them. Then I added a condition for Date Created is not in the last 15 days. Once you’ve set up the conditions, you tell Hazel what to do with files that meet the conditions. This is where you choose to move the files that meet the conditions and specify the media drive as the location. I looked to see if there was an iTunes play count condition but didn’t find one. There was a “last opened date” though, which might be good enough. Next, set it to move the file to the media drive, not copy or you just end up with the podcasts in two locations. Of course you want to test what you’ve built before declaring victory. One mistake I make every time is setting the boolean on the conditions. You probably want to change it to “all of the following conditions” but there’s also “any”. There’s also “none” so you can set the inverse conditions. Hazel is $32 but It does so many cool things I think it’s really worth every penny. For example you can use it to look inside files and rename them based on what it finds and then take action. I scan in my bills and the Hazel renames to files to match the gas company, phone company, etc and adds the invoice date of the bill and moves it to my Drobo. Wicked cool, but an advanced course for sure. If you need the advanced course on Hazel, I learned everything I know about it from David Sparks Hazel Video Field Guide over at macsparky.com. It’s about 2 hours of content but he walks you through every step with his usual good humor and fun instruction style. It costs another $20 but it made all the difference in the world in my understanding of the tool. A small typo on the spelling of MacSparky, it is missing the ‘s’. The picture shows a ‘Run AppleScript” “embedded AppleScript” action. What is the embedded AppleScript? Or is this an archive photo? Hozman – I glossed over that because it didn’t apply to the dumb questioner, but I have no problem explaining. In my case, I have my podcast files copied over to a Drobo, which is a Network Attached Storage unit. I have to ensure that the drive is mounted first, so I use an AppleScript to mount the drive. Under the conditions of the dumb question it would be a simple USB drive so that step wasn’t needed, but it’s pretty cool that Hazel supports AppleScript like that. If you have more questions about it, I’d be glad to answer.